Washington, NC -- With the hull and deck of a canopied 42-foot Fountain V-bottom reportedly being bonded together today at its Iconic Marine Group parent company headquarters in Washington, N.C., the build team is on track to have the boat ready for an attempt to break the V-bottom kilometer record early next year. That's the word from Reggie Fountain, III, who is working closely with his famous father-the founder of Fountain Powerboats-on the project. "It will be getting rigged in about two weeks," said the younger Fountain during a telephone interview this morning. "We should be testing by mid- to late-December, and then go for the record in January before the Miami International Boat Show. Our plan is to have the kilo boat on display in Miami." The current V-bottom American Power Boat Association-sanctioned kilometer record of 180.464 mph was set by an Outerlimits SV 43 in 2014. Prior to that, a 42-foot Fountain held the recordâset in 2004âat 171.880 mph. At its most basic level, a kilometer record is the average speed achieved by a boat in two passes, one in each direction, over a measured kilometer course. 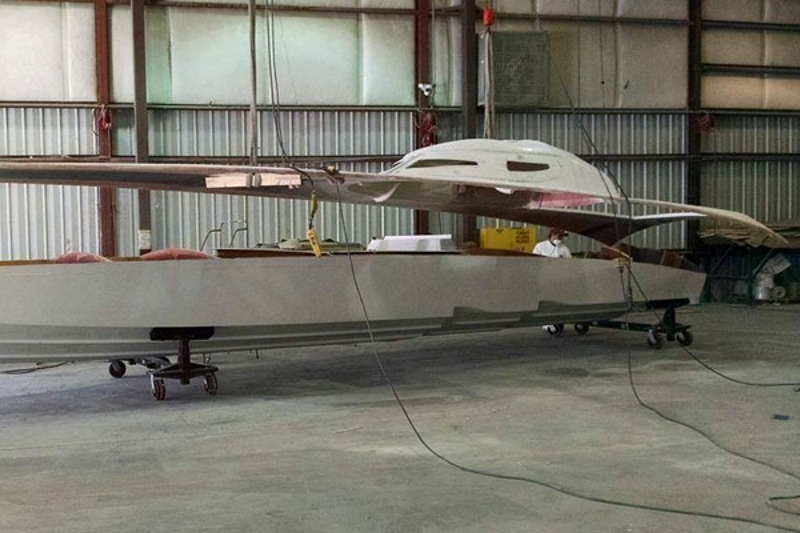 While the builder did use vacuum infusion in the lamination process for weight control of the new 42-footerâtechnically 40-feet long overall with its swim platform not included in the buildâand carbon-fiber reinforcement around the canopy area and over the stringers, the boat was built with conventional vinylester resin and fiberglass rather than epoxy and carbon fiber or Kevlar, according to Fountain. The cockpit is being constructed with a separate safety capsule for the driver and copilot, as well as a roll bar. A pair of turbocharged Sterling Performance engines in the 2,000-hp range with Mercury Racing No. 6 dry-sump drives will provide the power. For putting the power to the water, the company has ordered forged Hering propellers with pitches ranging from 37 to 40 inches. The new boat is 10 inches lower forward and 20 inches lower aft than the Fountain V-bottom that set the kilo record in 2004. "It's going to be a lot more aerodynamic than the original kilo boat," Fountain said. "And it's going to have 1,000 more horsepower." Fountain said the kilometer speed record event on the Pamlico River behind the Iconic Marine Group facility will involve both the American Power Boat Association-the domestic arm of the Union Internationale Motonautique-and Super Boat International, and will be open to all comers. Ben Robertson will return to the cockpit for next year's kilo record attempts-he and Reggie Fountain, II, set the record in 2004. Which Fountain-senior or junior-will join him in the cockpit has yet to be determined. But the Fountain team does already have a kilo-record goal in mind. "It should be around 200 mph," said the younger Fountain. "That's the number-that's what we'll be shooting for."